Receipts are really strange, aren’t they? You get them from literally everywhere, as if they’re something you want. But, most people just throw them out immediately as soon as they receive them. Then, when it comes to checking your credit card bill, you just have to assume that the merchant charged you the right amount. Of course, there are some brave souls who actually keep their receipts, and compare them to their credit card bill at the end of the month. My dad is like that. He’s an accountant by training, and that sort of organization is less intimidating for him. For the rest of us, it can be difficult. There are paid solutions for keeping track of receipts, aimed at the corporate world: Expensify, Verify, ReceiptBank. But, before we start spending $9, or $15, or $55 a month, let’s check out how to do this for free with Google Drive. 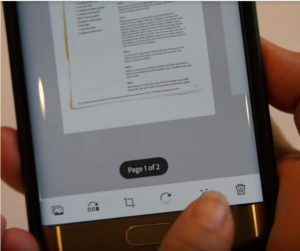 First off, we’re going to want to get Adobe Scan from the App store for Android or IPhone. Made by Adobe (duh), it’s a free solution that provides really high quality scans straight from your smartphone’s camera. Sign into Adobe Scan with your Google account, and use that as your login. Once you login into Adobe Scan with your Google account, here’s the process for using Adobe Scan to get your paper receipt or invoice into Google Drive. Trying your best not to cast a shadow over the receipt, open Adobe Scan, and allow it to automatically take a picture of the entire receipt. Once it does so, click on the image in the bottom right. Use the square looking button, third from left, to crop the photo to only show the receipt. I’ve attached a photo below so you can see what I mean. Click on the pencil up-top to rename the receipt something informative, like “Walmart Receipt, 2/28/2018”. Save the PDF using the top right button. Click the share button on the scan, then click “Share File”. Click the button that says “Save to Drive”. You’re done! You can organize the scans in Drive if you want, or you can just leave it be. Drive’s search function (shown below) is really powerful, and you’ll easily find any receipt that you need by just typing in the name of the company or the date. By the way, something to know is that for tax purposes, scanned receipts are totally fine. After you’ve scanned a receipt into Google Drive, you can throw it out. 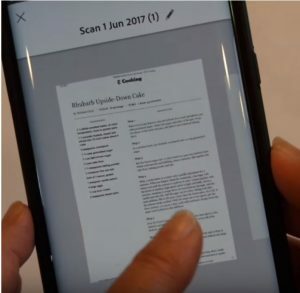 If you’d like to analyze your receipts after you scan them, including comparing receipts by individual line items, check out the free Google add-on Paperpusher.